I tested my Zenair 601 HDS with your VGs installed. Engine is 80hp Rotax 912. Prop is Woodcomp 3-blade in flight adjustable. I do have a new airplane!!!!!!!! I’m absolutely impressed and surprised about the results, never expected!
. And I hope to the ZENAIR homepage. Every one is impressed and will install your little things. On each wing I installed 38 VG’s and 33 VG’s on each elevator (lower side), a total off 142 VG’s, according your instructions. The following results are not yet the final results, but very accurate. From high altitude airport samedan LSZS, witch is at 5600 ft and OAT 15°C the lift-off speed was 42 kt with 2 persons and 72 lt fuel. Cruise-speed with max. power the same as before. You never use this. With typical cruise-power-settings between 12 lt/h and 15 lt/h an increase for approximately 2-3 kt in Speed with the same power setting. But very impressive is, the nose is 3° lower (less drag). 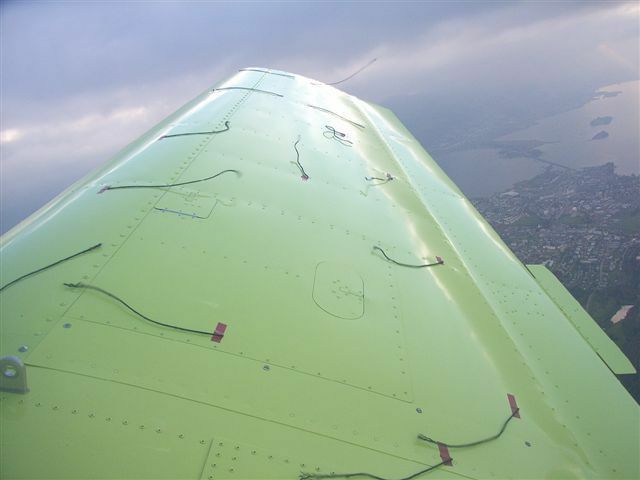 To find out the reasen I installed “stallfäden” on the wing, as you can see on the fotos, and we do now the same on 601 HDS without VGs. I can fly 360° turn with 58 kt IAS in only 15 sec., witch gives a circle diameter of less than 150 meters. I’m impressed, how much better the flight-characteristics at high altitude up to 13’500 fts are. A very big change! 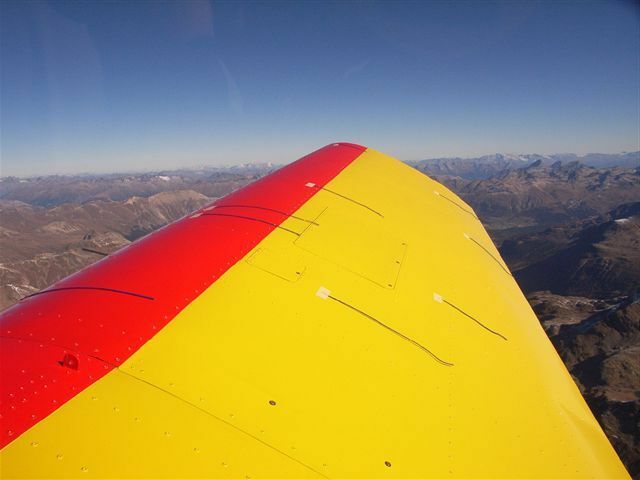 The cruise at very high altitude is much better. My approach speed is now 55 kt (before 65 kt) and touch down below 50 kt. Limited by tail contact. The flight controls are now much more comfortable, especially the elevator. The safety margin is improved considerably over the entire flight envelope. To install VGs is the best modification I ever made, even for a low investment. The only mistake I made, not to install VGs 800 flight hours earlier. 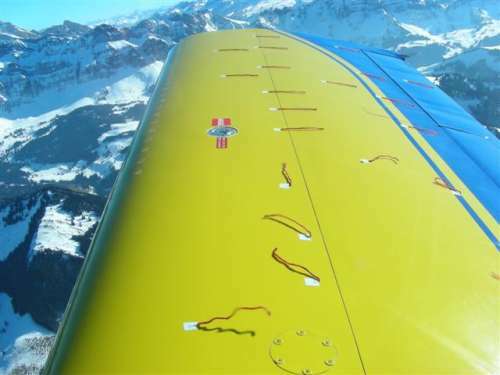 Tuft testing over the Alps with Stolspeed VGs. Note the very high angle of attack and the clean airflow. An identical HDS without VGs. 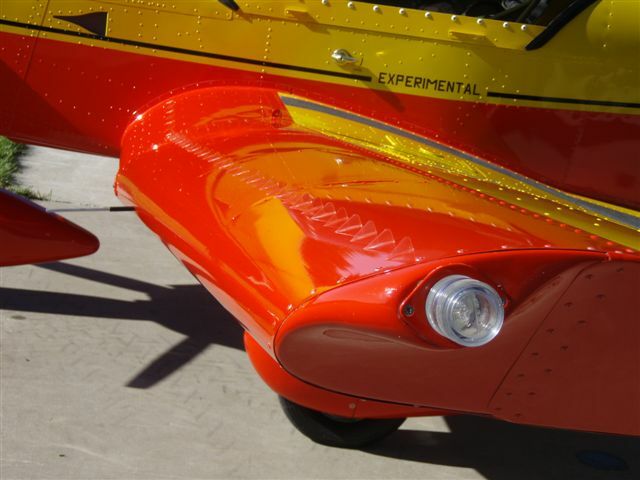 Note the disrupted airflow at a lower angle of attack. Another 601 wing, this time with VGs only on the outer portion. Note the difference in airflow!! Viktor installing Stolspeed VGs on his HDS wing. Viktor is a keen and experienced experimenter and flyer. See photos of some of his adventures. rpm. 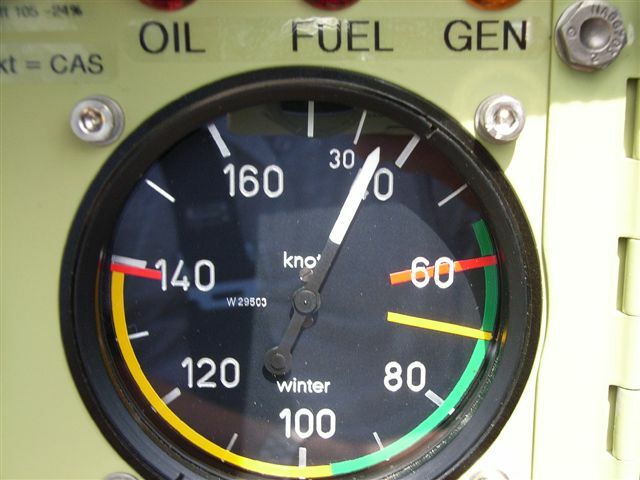 I re-checked stall speed before VG installation at 3000 ft and air temp of 49 degrees F as being "stall buffeting at 58 mph IAS (all speeds IAS) and full stall at 56 mph". Test conditions air temp was 40 degrees F. Altitude 3000 ft. Atmos. pressure approx equal. Takeoff weight equal to test flight. First impression was an increase in climb rate at 80 mph. Rough attempt to measure would be an extra 200 ft/min. Pre-stall buffeting now begins at 54 mph and is significantly more apparent. Full stall at 52 mph, no more abrupt than without the VGs. There appears to be no measurable difference in cruise speed - the 120 mph. Since I only made one landing I will make no comment as to stability, but greased it on using my normal over the fence speed of 75 mph. No VGs parted company. rpm on the 912 I was climbing very slowly at 55 mph with the nose pointingup at what seemed like 45 degrees. So far, certainly meeting expectations! got the results I posted above. at all. Stall is maybe a bit lower than with the 10% application. rubbed off the wings with the fingers. For me, they are a well worthwhile improvement. The following is a link to a wesite created by Peter Chapman, in Canada, regarding the results of his testing of Stolspeed VGs on his 601HDS. There are videos and still photos of tuft testing there.